When people discover binary options trading, they sometimes won’t believe that it possible to make money in such a straightforward. That is why they will start to think that binary options are scam. Well, they are not. Not more than Forex, futures, stocks or any other market or trading instrument that you can think of. Trading binary options is like any other trading, if you have a profitable system, you will make money. Trading is just about having an edge. If you are able to predict price movements with a certain probability, you can be successful in trading. Where scammers come into play is among brokers. If you choose the wrong one, you will lose your money no matter how you trade. 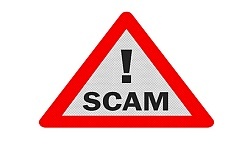 Binary options scams have two basic shapes. The first one is price manipulation. It happens when you are profitable. The broker will manipulate the price feed to make you lose your trades. He will either add huge spreads or move the price at expiration. The only purpose being losses on your account. The second one is withdrawal refusal. Bad binary options brokers tend to ignore withdrawal requests. They will delay them as much as possible and they won’t hesitate to lie saying that your money was sent even if it was not etc. That is the real binary options scam. Not binary options as such, but the behavior of some brokers. If you find your broker doing these thing, try to take your money and go away as fast as possible. But in the first place try to avoid all this by being very careful when choosing your binary options broker.